Installing a basement waterproofing systeminside of your home is a fantastic idea. With all the innovations that have been made in the last decade on old-fashioned drain tile, French drain, and weeping tile systems in Pennsylvania, New Jersey, and Delaware, along with the modern and more reliable sump pump systems, a waterproof basement is just a phone call away. Call Philadelphia Basement Systems today for a free basement waterproofing inspection and quote! 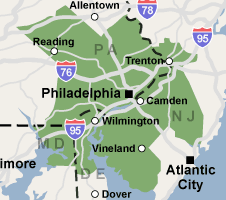 We serve Philadelphia, Newark, Reading and all areas nearby. Instead, Philadelphia Basement Systems recommends installing one of our basement wall systems, like BrightWall®; a plastic wall covering that is mechanically attached to the wall and can be installed as a vapor barrier. Philadelphia Basement Systems has the answer to your dry basement needs: The SaniDry™ XP Basement Air System. This is the only dehumidifier available in Pennsylvania, New Jersey, and Delaware that has the power and effectiveness you need. Philadelphia Basement Systems is the premiere basement waterproofing contractor in Trenton, Camden, Wilmington, Cherry Hill, Bensalem, Vineland, Chester and other parts of Pennsylvania, New Jersey, and Delaware. If you're in need of wet basement repair, we're ready to help. Waterproofing is our specialty, and with our great reputation in the community, you can be sure we'll be here whenever you need us.